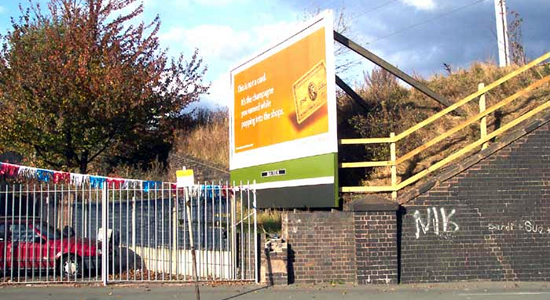 Ettingshall Road station opened in 1852 under the LNWR between what was then Deepfields and Coseley station and Wolverhampton (Monmore Green not opening until 1863). As with Monmore Green itself, I have been unable to locate a suitable photograph to show what the station looked like in its heyday - if anyone has one I'd be grateful if you'd let me know. Unfortunately, as will be discerned by the above photograph, the line itself is on an embankment and I couldn't fugure out a way to get to track level to discern whether or not anything remains: as the station closed in 1964 there is a possibility that some indication has remained at track level. 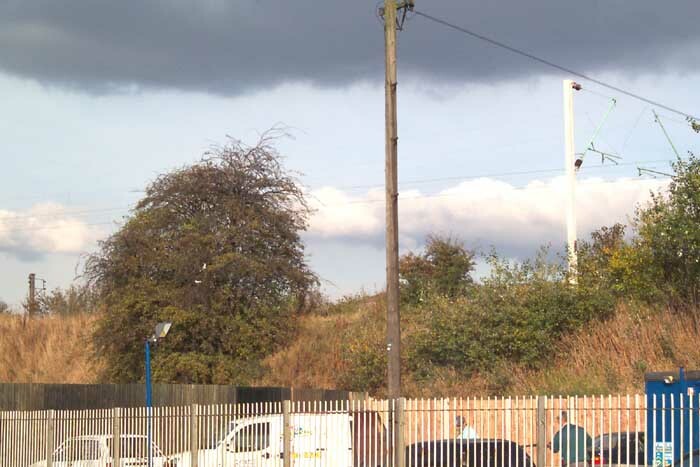 The photograph above shows the site of the entrance to Ettingshall Road station from Parkfield Road, October 2003. Above-left is the car repair garage occuppying the site of the station entrance on Parkfield Road: interestingly, a passer-by did suggest that this was infact the converted station house but as I haven't seen a photograph of the station buildings I can neither confirm nor deny this - let me know if you can as I'd be interested to know. 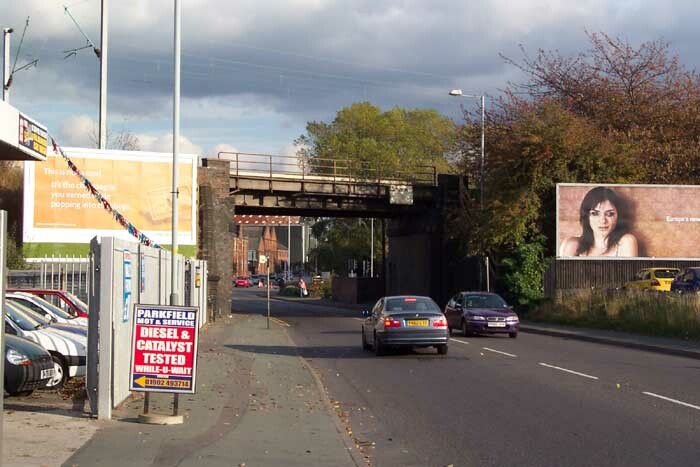 Above-right we are again on Parkfield Road looking up to the site of the old station. 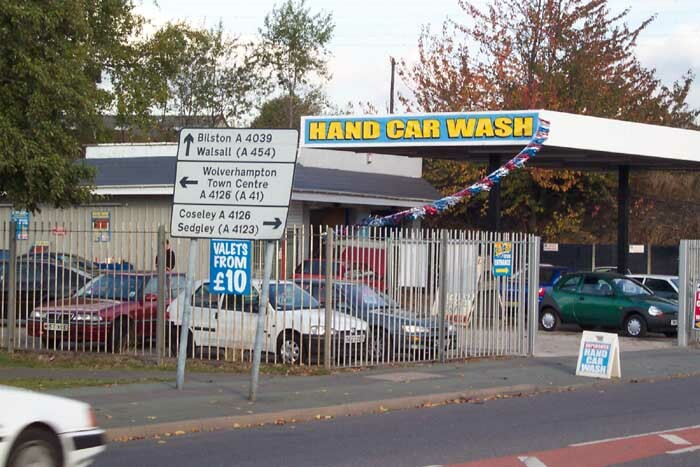 Above-right we are on Parkfield Road with the station site to our left and the Parkfield Road bridge ahead. 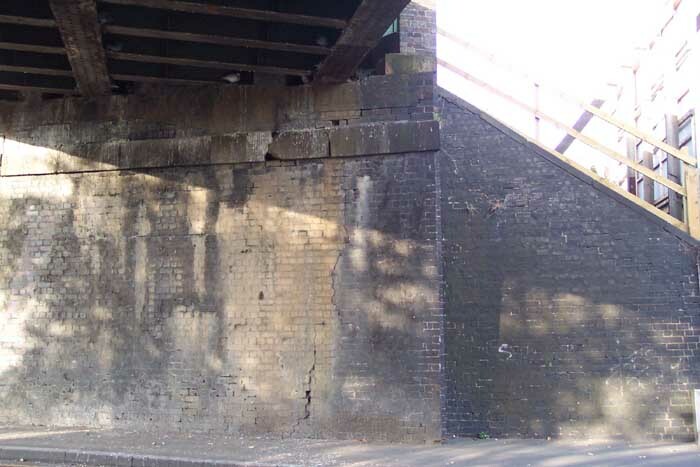 Above-right we are underneath the Parkfield Road bridge looking in the direction of the station site and running top to bottom, but not too clear at the low resolution I've applied to the photograph to cut down on download time, is a large crack in the brickwork and the brickwork directly underneath the trackbed looks decidedly unstable too!